Situated about a half-hour north of Seney at the northern terminus of M-77 lies the quaint, summertime seascape community of Grand Marais. This small town of sand and sea, shops and seasonal homes is the eastern gateway community for Pictured Rocks National Lakeshore, the nation’s first such National Park Service unit, authorized in 1966. At this end of the national lakeshore — known best for its towering, mineral-stained cliffs — is where sand, rather than stone, is the showpiece. 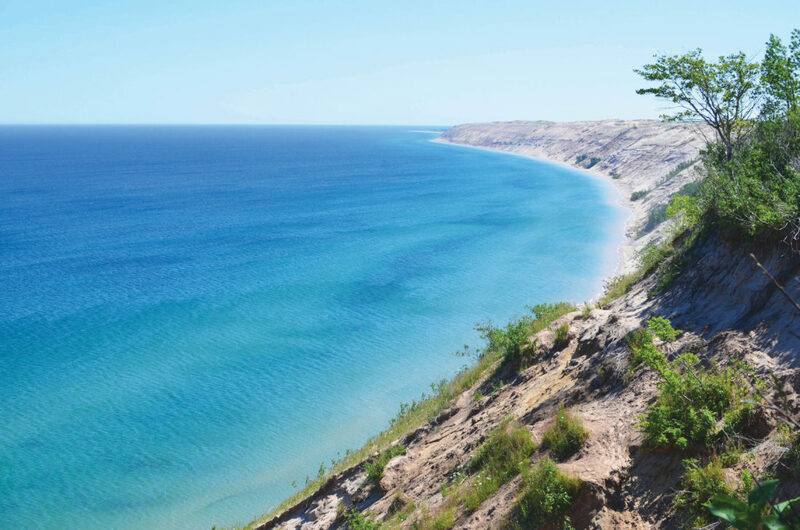 Specifically, the Grand Sable Dunes, perched atop the 300-foot high Grand Sable Banks. 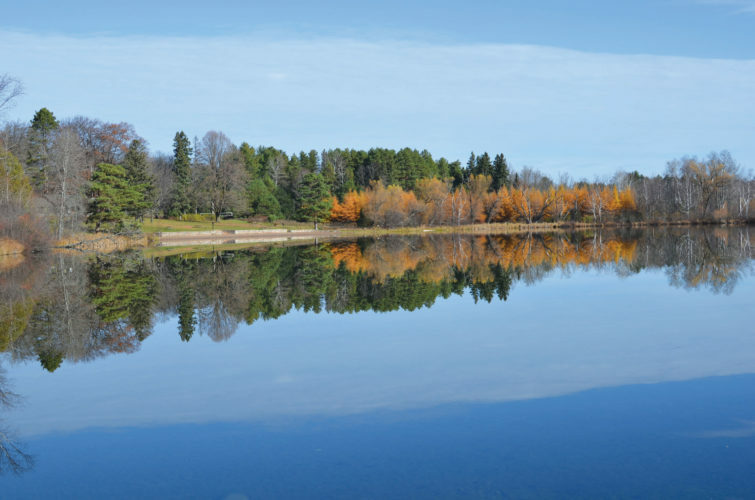 This is also home to fishing and camping along Grand Sable Lake. 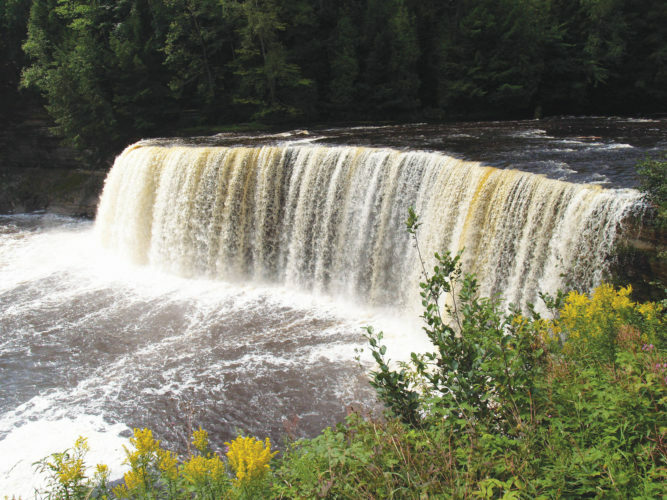 Sable Falls is also here, a delightful cataract tumbling down over the rocks, flowing toward Lake Superior. 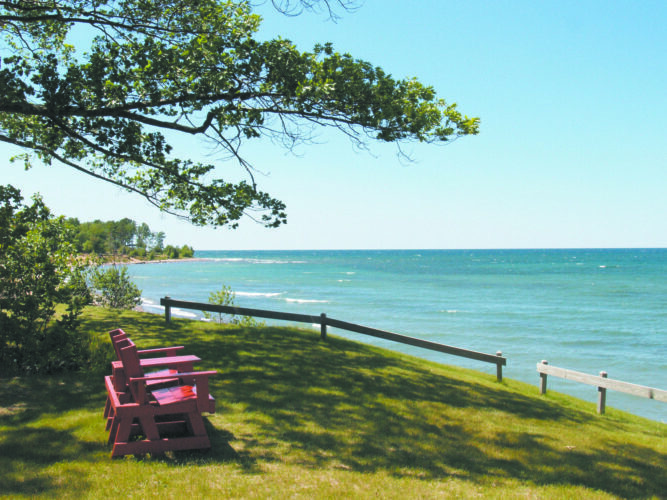 Continuing west, the mid-section of the park includes the stunning scenery of Twelvemile Beach, the Au Sable Lighthouse and the Hurricane River. Not far away is a self-guided nature trail through the white birch “ghost” forest. Alger County Highway 58 winds just over 40 miles from Grand Marais, west to Munising — the western gateway community — providing one of the most scenic and interesting routes for motorcyclists. More sights at Pictured Rocks include the Beaver Basin, Chapel Rock, Chapel Falls and Mosquito Falls, all accessible by trails weaving through the park’s heartland. Spray Falls tumbles over the rocky ledge into Lake Superior marking the eastern extent of the Pictured Rocks cliffs. “Colorful and bold, the Pictured Rocks cliffs tower 50 to 200 feet directly from Lake Superior. These sandstone cliffs stretch for about 15 miles along the lake from Sand Point on the west to just after Spray Falls on the east,” the park’s website states. “The name ‘Pictured Rocks’ comes from streaks of mineral stain that decorate the face of the weather-sculpted sandstone. Stunning colors occur when groundwater oozes out of cracks and trickles down the rock face. Iron (red and orange), copper (blue and green), manganese (brown and black), and limonite (white) are among the most common color-producing minerals. The park also offers additional attractions at its western end, the most heavily-used portion of the park. Here visitors will find Sand Point, Miners Beach at the mouth of the Miners River, Miners Falls and the park’s signature rock formation — Miners Castle. Near the village of Melstrand, the Michigan Department of Natural Resources maintains several state forest rustic campgrounds. Kingston Lake is one of these located about 16 miles farther east along the southern boundary of the park. 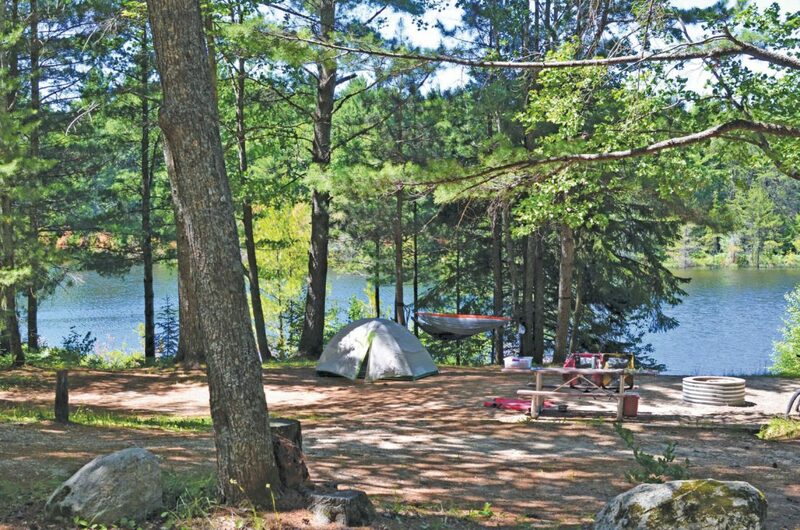 The 16-site campground at Kingston Lake connects to the Fox River campground (five sites) located in Seney Township via the nearly 28-mile-long Fox River Pathway. Jewels in the dazzling crown of quiet state forest campgrounds south of Melstrand include North Gemini Lake, Canoe Lake, Ross Lake, South Gemini Lake and Cusino Lake. The 1.5-mile Gemini Lake Pathway rambles through the woods from the South Gemini Lake State Forest Campground. 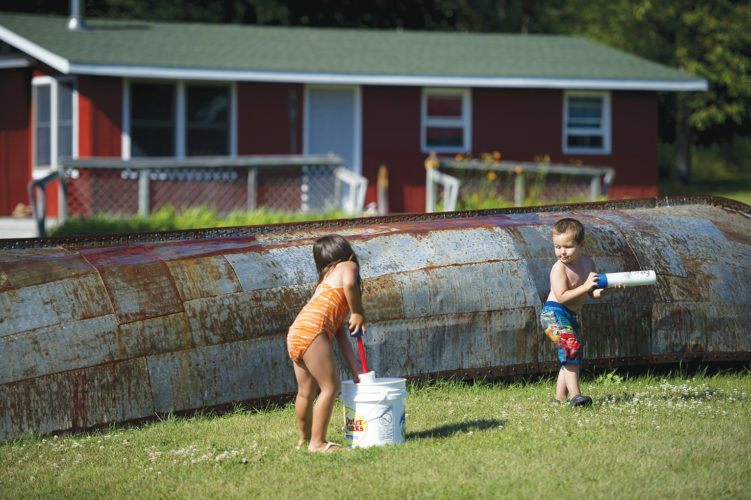 These five rustic campgrounds, with sites that include toilets, fire rings and water pumps, offer a total of 45 campsites tucked into the northern Schoolcraft County woodlands. Another of these campgrounds is located off M-77 along the East Branch of the Fox River, north of Seney in Schoolcraft County. Heading east out of Grand Marais into Luce County, visitors will be opening a door to grand exploration with a baker’s dozen more state forest campgrounds, as well as Muskallonge State Park, which sits just south of the Lake Superior shoreline. Across this entire area, there are endless opportunities for anglers, paddlers, hikers, bicyclists, campers, picnickers, stargazers and photographers. History buffs will find countless stories to read about and tell from these shores. Grand Marais is home to the only harbor of refuge between Whitefish Point and Munising. Recreational boaters use the harbor to find fruitful fishing waters within the depths of Lake Superior. 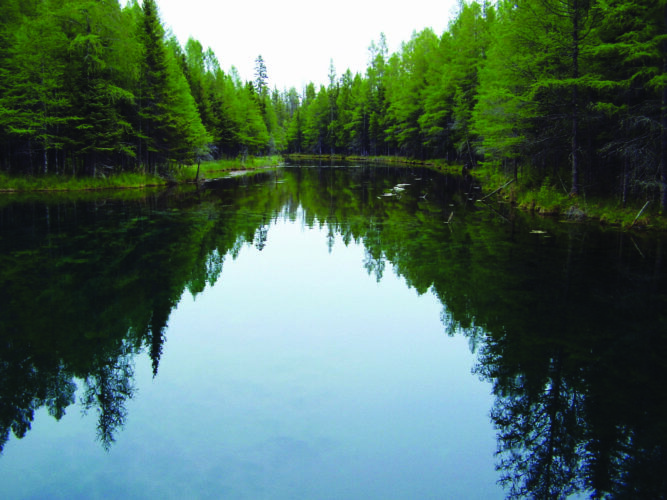 “Our green springs, warm summers, beautiful autumns, and snowy winters make Grand Marais a year-round recreation destination,” the community’s website reads. Activities the town provides include a Trunk Treasures flea market at the end of July and in mid-August, the Grand Marais Music and Arts Festival (Aug. 10-12) and a Sept. 14 classic car show. For centuries, this part of Michigan has been known and visited by humans for a range of purposes from subsistence, fishing and gathering to the recreational pursuits of today’s modern visitors. Tuck yourself into these woods, find the secluded waters, the places where the deer lie down in the shade. Pull up a chair and a listening ear and see what the campfire has to say here in this land of adventure.